We'll be there as part of Judy's Affordable Vintage Fair, be there or be square! Complete with name badge. Jacket and top Fashion Union. I do follow entrepreneur @DuncanBannatyne on Twitter, and although I'm still a devout fan of Anthony Robbins and use his book 'Awaken the Giant Within' as my entrepreneurial bible, I'm rapidly becoming a Bannatyne convert. 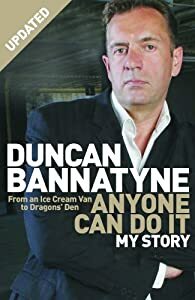 Bannatyne's book 'Anyone Can Do It' makes a fascinating read for budding British entrepreneurs. He reckons £100 million is easy to make, and he should know. Coming from a poor background without an education, the Yellow Pages were his bible, along with bucket loads of determination! Buy through through my British amazon.co.uk store, and start realising your dream now!! Just a reminder that we're trading at the Essex Vintage Fashion Fair on Sunday, be there or be square! Hi. Just had to write a review about Fantasia, which we watched last Saturday. If you love amazing classical music and artistic expression, you'll adore this film. Way ahead of its time, it's hard to believe Fantasia was made in 1940. The superb music is accompanied by incredible animated features, all done without the aid of computers of course. Just wonderful, my favourite is the Sorcerers Apprentice. Buy through through my British amazon.co.uk store, or American amazon.com store. Have a great weekend.